Rheumatoid arthritis is a chronic (long-term) disease that causes inflammation of the joints and surrounding tissues. It can also affect other organs. Usually, rheumatoid arthritis affects joints on both sides of the body equally. 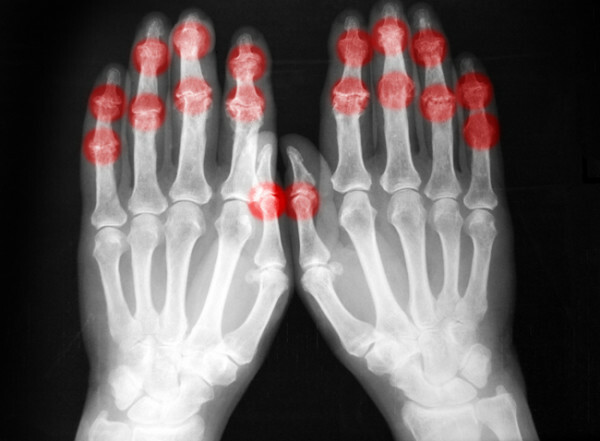 The wrists, fingers, knees, feet, and ankles are most commonly affected. What causes Rheumatoid Arthritis and who is at risk? The cause of rheumatoid arthritis is unknown. It is considered an autoimmune disease; that is, a disease where the body’s immune system, which normally fights off foreign substances such as viruses, confuses healthy tissue for foreign substances. The result of this is that the body attacks itself. Rheumatoid arthritis can occur at any age but it is usually seen in people aged between 25 and 55. Women are affected more often than men. The course and severity of the illness can vary considerably. Infection, genes, and hormones may all contribute to the development of the disease. Anemia may occur due to failure of the bone marrow to produce enough new red cells. Joint destruction may occur within 1-2 years after the appearance of the disease. Rheumatoid arthritis is diagnosed based on the results of Joint x-rays and a Rheumatoid factor test (which is positive in about 75% of people with symptoms). In addition, the Erythrocyte sedimentation rate is elevated and the complete blood count (CBC) may show low hematocrit (anemia) or abnormal platelet counts. A C-reactive protein test may also be positive for patients with no detectable rheumatoid factor andSynovial fluid analysis may be used to diagnose the cause of pain and swelling in joints. There is no known way of preventing the development of rheumatoid arthritis. However, proper early treatment can prevent further damage of the joints. It is also important to note that because rheumatoid arthritis may cause eye complications, patients should have regular eye exams. Rheumatoid arthritis usually requires lifelong treatment with medications, physical therapy, exercise, education, and possibly surgery. Early, aggressive treatment of rheumatoid arthritis can delay joint destruction. Rheumatoid arthritis is a disease with variable prognosis that can impair the quality of life. Once a diagnosis of rheumatoid arthritis is confirmed, treatment should start as soon as possible. In addition to rest, strengthening exercises and anti-inflammatory drugs (NSAIDs), the current standard of care involves aggressive therapy with disease-modifying anti-rheumatic drugs (DMARDs). Traditionally, rheumatoid arthritis treatment was introduced in a stepwise manner. Initially agents such as analgesics, non-steroidal anti-inflammatory drugs (NSAIDs) and corticosteroids were used to give symptomatic relief. Disease modifying agents e.g. sulfasalazine and azathioprine were only added when symptoms were not adequately controlled. Such an approach did give temporary clinical improvement in disease activity but did not halt disease progression. The aim of treatment now is to achieve lowest possible level of arthritis disease activity so that there’s minimal joint damage, and if possible to bring on disease remission. This approach has led to earlier use of DMARDs. DMARDs are the most effective agents available for controlling rheumatoid arthritis, but they all have a slow onset of action. Mechanisms of action for most of these agents are not known and they all are different but they all appear to slow or stop the changes in the joints. They can alter laboratory characteristics of disease activity and delay the progression of bone damage. Patients taking DMARDs generally show some response within 8 to 10 weeks. However, this is variable depending on the patient and drug. Dose of DMARDs is titrated up as far as side effects allow. An additional DMARD is added when the maximum dose is reached, or the initial DMARD is stopped and switched to another. Most DMARDs require monitoring (such as full blood count, liver function test, urea and electrolyte level test) to ensure drug safety, as the majority can cause bone marrow toxicity and some can cause liver toxicity as well. Regular blood or urine tests should also be done to determine how well medications are working. Methotrexate is probably the most commonly used DMARD. It is effective in reducing signs and symptoms of rheumatoid arthritis and slows down damage to the joint. Results can be seen in 6 to 8 weeks. Other DMARDs such as hydroxychloroquine and sulfasalazine can used in conjunction with methotrexate. Hydroxychloroquine, an antimalarial drug, is effective in the treatment of rheumatoid arthritis. It is usually used in combination with methotrexate and sulfasalazine for added benefits. Sulfasalazine is also an effective DMARD. It can reduce symptoms and slow down the joint damage. Leflunomide shows similar effectiveness to methotrexate and can be used in patients who cannot take methotrexate. Tumor necrosis factor (TNF) inhibitors are a relatively new class of medications used to treat autoimmune disease. They include etanercept, infliximab, adalimumab, tocilizumab, certolizumab and golimumab. TNF Inhibitors are also called “Biologics” biological response modifiers. Tumor necrosis factor alpha is produced by macrophages and lymphocytes, and acts on many cells in the joints and in other organs and body systems. It is a pro-inflammatory cytokine known to mediate most of the joint damage. In rheumatoid arthritis it is produced by the synovial macrophages and lymphocytes. By inhibiting TNF alpha the inflammation process, which attacks or damages the joint tissue, is halted or slowed. Methotrexate can be used with TNF inhibitors to increase the effectiveness of therapy. Gold is also effective in the treatment of rheumatoid arthiritis, particularly when given intramuscularly. It isn’t used as often now due to its side effects and slow onset of action. Oral gold preparation is available but is less efficacious compared to the intramuscular preparation. Abatacept decreases T cell proliferation and inhibits the production of the cytokines tumor necrosis factor (TNF) alpha, interferon-γ, and interleukin-2. Rituximab depletes the B cells, which have several functions in the immune response. Rituximab has reduced signs and symptoms of rheumatoid arthritis, and manages to slow down the joint destruction. The Interleukin-1 Inhibitor, Anakinra, is a new synthetic protein that blocks the inflammatory protein interleukin-1. Anakinra is used to slow progression of moderate to severe active rheumatoid arthritis in patients who have not responded to one or more of the DMARDs. Alkylating agents, such as cyclophosphamide, are drugs that suppress the immune system and are sometimes used in people who have failed other therapies. These medications are associated with toxic side effects and usually reserved for severe cases of rheumatoid arthritis. Corticosteroids have been used to reduce inflammation in rheumatoid arthritis for more than 40 years but it is not known whether they can slow down the progression of disease. It can be used in conjunction with other rheumatoid arthritis medicine. Potential long-term side effects of corticosteroids limit the use of oral corticosteroids to short courses and low doses where possible. Side effects may include bruising, psychosis, cataracts, weight gain, susceptibility to infections and diabetes, high blood pressure and thinning of the bones (osteoporosis). A number of medications can be administered with steroids to minimize the risk of osteoporosis. Intra-articular steroid injections can effectively relieve pain, reduce inflammation, increase mobility and reduce deformity in one or a few joints. If repeated injections are required then the dose of DMARDs should be increased. Acetaminophen and acetaminophen combinations (with aspirin or narcotics) are useful for minor pain. They have a place both in the early stages of disease on a “when required” basis to help relieve pain until DMARDs become effective, and regularly in the later stages of the disease. Most people can take acetaminophen without any problems so long as they do not exceed the recommended dose (maximum of 4 grams in 24 hours, in 4 divided doses of 1 gram every 4 to 6 hours). It reduces mild pain but does not help with inflammation or swelling. Acetaminophen with aspirin and or caffeine are over-the-counter medicines and some people may use these initially to control their pain. Acetaminophen with codeine, propoxyphene or narcotics are prescription medicines. Anti-inflammatory agents used to treat rheumatoid arthritis are salicylates and non-steroidal anti-inflammatory drugs (NSAIDs). NSAIDs also includes Cycloxygenase-2 Inhibitors (COX-2 Inhibitors). NSAIDs are used for the relief of pain and inflammation in rheumatoid arthritis. However, these do not change the course of disease or prevent joint destruction. Although NSAIDs differ in structure they all have similar antipyretic, anti-inflammatory and analgesic properties. However, there can be considerable variation in individual patient response and tolerance to different NSAIDs. NSAIDs primarily work by inhibiting arachidonate cyclo-oxygenase (COX enzyme) and thus inhibits the production of prostaglandins and thromboxanes. There are two types of COX enzymes, COX-1 and COX-2. COX-1 is expressed in most tissues, including platelets. COX-2 is induced in inflammatory cells when they are activated and the primary inflammatory cytokines (interleukin-1 and tumor necrosis factor alpha). COX-2 enzyme is responsible for production of mediators of inflammation. Most NSAIDs are inhibitors of both isoenzymes. The anti-inflammatory action of NSAIDs is mainly due to inhibition of COX-2, and their unwanted side effects are largely due to inhibition of COX-1. The most common side effect of NSAIDs is gastrointestinal irritation, which can even lead to gastrointestinal ulceration or bleeding. NSAIDs must be taken with food to prevent or minimize these side effects, but this does not decrease the risk of bleeding. Taking a combination of NSAIDs, or NSAIDs and aspirin together increases the risk of stomach ulcers or gastrointestinal bleeding. Long term use can also cause possible heart problems. In April 2005, the FDA asked drug manufacturers of NSAIDs to include a warning label on their product that alerts users of an increased risk for cardiovascular events and gastrointestinal bleeding. Taking gastroprotective agents such as proton pump inhibitors (esomeprazole, omeprazole, lansoprazole, pantoprazole and rabeprazole) togetherwith NSAIDs may decrease gastrointestinal irritation, ulceration or bleeding caused by these agents. As prostaglandins also regulate blood flow in the kidneys, NSAIDs may lead to impaired renal function in some patients. This can consequently cause salt and water retention, and increased blood pressure. Combination drug products contain an NSAID and a stomach protecting agent, to prevent or treat the gastrointestinal side effects which may be caused by NSAIDs. Cycloxygenase inhibitors block an inflammation promoting enzyme called COX-2. This class of drugs was initially believed to work as well as traditional NSAIDs, but with fewer stomach problems. However, numerous reports of heart attacks and strokes have promoted the FDA to re-evaluate the risks and benefits of COX-2 Inhibitors. Rofecoxib (Vioxx) and valdecoxib (Bextra) have been withdrawn from the U.S. market following reports of heart attacks in some patients. The available drugs in this class have been labeled with strong warnings and a recommendation that these be prescribed at the lowest possible dose and for the shortest duration possible. COX-2 Inhibitors, like other NSAIDs, don’t delay progression of the disease. They only provide symptomatic relief. The course of rheumatoid arthritis differs from person to person. People with rheumatoid factor or subcutaneous nodules seem to have a more severe form of the disease. People who develop rheumatoid arthritis at a younger age also have a more rapidly progressive course. Remission is most likely to occur in the first year. The probability decreases over time. By 10 to 15 years from diagnosis, about 20% of people have remission. More than half (50-70%) of patients are able to work full time. After 15 to 20 years, 10% of patients are severely disabled, and unable to do simple daily living tasks such as washing, dressing up and eating. The average life expectancy for a patient with rheumatoid arthritis may be shortened by 3 to 7 years. Those with severe forms of rheumatoid arthritis may die 10 to 15 years earlier than expected. However, as treatment for rheumatoid arthritis improves, severe disability and life threatening complications appear to be decreasing. Occassionally, surgery is needed to correct severely affected joints. Surgery can relieve joint pain, correct deformities, and modestly improve joint function. The most successful surgeries are those performed on the knees and hips. The first surgical treatment is a synovectomy or knee arthroscopy, which involves removing the joint lining (synovium). A later alternative is total joint replacement with a joint prosthesis. In extreme cases, total knee or hip replacement can mean the difference between being totally dependent on others and having an independent life at home. Range of motion exercises and individualized exercise programs prescribed by a physical therapist can delay the loss of joint function. Joint protection techniques, heat and cold treatments, and splints or orthotic devices to support and align joints may also be very helpful. Sometimes therapists will use special machines to apply deep heat or electrical stimulation to reduce pain and improve joint mobility. Occupational therapists can also construct splints for your hand and wrist and teach you how to best protect and use your joints when they are affected by arthritis. They also show people how to better cope with day to day tasks at work and at home, despite limitations caused by rheumatoid arthritis. Frequent rest periods between activities, as well as 8 to 10 hours of sleep per night, are recommended. The Prosorba column is a device that removes inflammatory antibodies from the blood; it is used for the treatment of moderate to severe rheumatoid arthritis in adults with long standing disease, who have not responded to DMARDs. The procedure takes 2 to 3 hours and must be done once a week for 12 weeks. Studies have reported that rheumatoid arthritis slows down or stops getting worse in about one third to a half of the people who receive this treatment. Side effects include anemia, fatigue, fever, low blood pressure and nausea. Some people have developed an infection from the tube used to remove the blood. Often there is a flare up of joint pain for several days after the treatment. Rheumatoid arthritis is not solely a disease of joint destruction. It can involve almost all organs. A life threatening joint complication can occur when the cervical spine becomes unstable as a result of rheumatoid arthritis. It can cause eye complications so patients should have regular eye exams. Rheumatoid vasculitis (inflammation of the blood vessels) is a serious, potentially life threatening complication of rheumatoid arthritis. It can lead to skin ulcerations an infections, bleeding stomach ulcers, and nerve problems that cause pain, numbness, or tingling. Vasculitis may also affect the brain, nerves, the heart. It can cause a stroke, heart attack or heart failure. Rheumatoid arthritis can cause the outer linning of the heart to swell (pericarditis) and cause heart complications. Inflammation of the heart muscle, called myocarditis can also develop. Pericarditis and myocarditis can lead to congestive heart failure.